Jednodńuwka futurystuw [The Futurists’ Day] was a short-lived Polish futurist periodical. The first issue was published in June 1921 in Krakow and edited by Bruno Jasieński. The next one, entitled Nuż w bżuhu [A Knife in the Stomach] was edited by Jasieński and Anatol Stern in Krakow and Warsaw in November 1921. The latter one was first distributed in Krakow on 13 November 1921, and two weeks later in Warsaw, to be confiscated some three weeks later. Jednodńuwka futurystuw. mańifesty futuryzmu polskiego (June 1921). 4 pages, 94 x 32 cm. Download. Nuż w bżuchu. 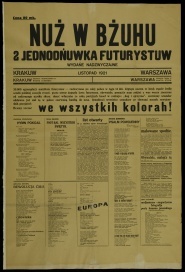 2 jednodńuwka futurystuw (November 1921). 2 pages, 96 x 63 cm. Download. This page was last modified on 11 August 2014, at 00:33. This page has been accessed 6,216 times.